Denver’s homeless population can now access comprehensive healthcare all in one place at the new Stout Street Health Center. 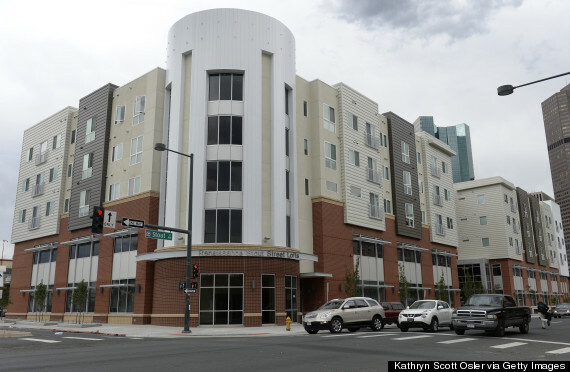 The new facility, developed and operated by the Colorado Coalition for the Homeless, officially opened its doors last week, becoming the first-of-its-kind in the country. Building America CDE, a subsidiary of the AFL-CIO Housing Investment Trust, helped to finance the $35 million development with an $8.5 million allocation of New Markets Tax Credits. The new 53,192 square foot center replaces the old Stout Street Clinic across the street and was built using 100% union labor, creating 210 union construction jobs. Patients can now receive treatment for mental and physical health, substance abuse, dental and vision health as well as have access to the pharmacy and social services available at the 5-story building. In addition, there are 78 units of supportive housing for formerly homeless households above the clinic. President of the Colorado Coalition for the Homeless, John Parvensky, said the health center is “the most advanced integration of mental and physical health care in the country for the homeless or anyone else.” He also indicated that the facility is expected to reduce state and local costs for emergency healthcare, detox and other services by 30% annually. Additionally, this project will increase integrated health care access for up to 18,000 homeless individuals each year.